A few days ago I received the Poetry Book Society Spring choice – Rachael Allen‘s Kingdomland. I haven’t had time to fully read, let alone digest, all the poems, but the ones I’ve looked at so far are very impressive. and let the pigs root through my chest. I’m looking forward to the poems I haven’t reached yet. A belated Happy New Year to all my readers. I hope you have had a good festive season and are enjoying the feeling of newness that a new year can bring. After a lot of hectic: travel, parties, shopping, eating etc, etc, I have finally got around to seriously reading the winter offering from the Poetry Book Society – Joy by Sasha Dugdale. Along with the selected book comes the quarterly PBS Bulletin. Now the Society has updated it and it looks completely different. After years of receiving the old one I’m a bit nostalgic for its look and feel, but the new version is very nice and no doubt I’ll get used to it. So I start 2018 with some newness spilling over from last year. The current quarterly book from the Poetry Book Society is Measures of Expatriation by Vahni Capildeo. The poetry is varied and includes several prose poems, some quite long. Prose poems aren’t my favourite type of literature, but I am enjoying these. The rich descriptions and some quirky viewpoints are refreshing. Apparently prose poetry is a relatively recent genre. A Japanese form, haibun, was in vogue in the 17th century, but in the west it was over a hundred years later that poets started to use it in its full form. Reading about the early prose poets reminded me of a ‘tale’, which I read years ago – Landor’s Cottage by Edgar Allan Poe. It is not the purpose of this work to do more than give in detail, a picture of Mr. Landor’s residence – as I found it. I think it comes close to modern prose poetry, in its intent and richness, but it misses by being definitely prose. Mr Poe, leader in several literary genres, lost an opportunity to be a major model for, what was in his time, a new poetic form. Today the form is popular with a lot of poets, but Ms Capildeo is the first I’ve come across who makes me want to take my interest further. Yesterday I received my quarterly mailing from the Poetry Book Society. This time the book was When God is a Traveller by Arundhathi Subramaniam, who writes in English but lives in India. As always, there’s something appealing about the slim book of verse with an exotic title; something that encourages both reading and thinking. Inside the colourful cover I love the way the poet uses the page, laying out her poem to enhance it’s meaning and to guide the eye to the emphasised bits. in everyone’s life but your own. Isn’t this kind of recognition at the heart of all spiritual experience? Along with the book and the Bulletin I’ve also received a booklet, Next Generation Poets 2014: a selection of poems from writers who might be the leaders of poetry in the future. This is part of a major campaign by the Society to bring to their work to the public. They define the next generation poets as having published their first collection within the last decade. As might be expected, the photos and brief bios in the booklet indicate that most of the poets are quite young, though a few could describe their ages as ‘late youth’. I wonder if someone who published their first collection at the age of 90 would still be of the ‘next generation’. I like the idea of this strange extension of life. How long does a ‘next generation’ last? Perhaps in twenty years time their spirit can look down from Heaven (or up from the other place) and watch budding poets reading their collection. Yesterday I received the current book from the Poetry Book Society. 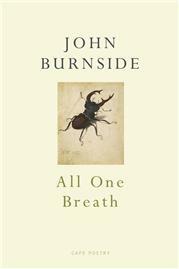 It is All One Breath by John Burnside – elegant and enticing in its smart Cape Poetry off-white cover. According to the magazine that came with it, this is the Spring 14 book. Yesterday spring was a bit of a joke, but today the sun is shining and it’s approach is a bit more believable. For that which befalleth the sons of men befalleth beasts; even one thing befalleth them: as the one dieth, so dieth the other; yea, they have all one breath; so that a man hath no preeminence above a beast. As someone concerned with animal rights, I find this verse a banner to campaign under and a comfort when I read about the dangers animals face today. I wonder why I’ve never heard of it before. Back to the poetry. I haven’t read much of the book yet, but I can see that it isn’t all about animals. The ‘all one breath’ applies to humans too. This major poetry prize, run by the Poetry Book Society (PBS), has reached a milestone. Over the years many well-known poets have been shortlisted and this year is no different. In 2011 the prize ran into some controversy when John Kinsella and Alice Oswald, two of the shortlisted poets, withdrew from the competition. They felt they could not take part after sponsorship from Aurum, a fund management company, was announced. the Prize will benefit from the second year of Aurum support, so publishers should not enter their work unless the poet accepts this. To celebrate twenty years of supporting and encouraging poetry, the PBS is running a national T S Eliot Prize 20th Anniversary Tour which will visit Portsmouth, Winchester, Oldham, Halifax, Ludlow, Glasgow, Norwich, Liverpool, Durham and Sheffield between 17 September and 15 October. Has poetry changed much in the last twenty years? I think performance poetry has increased and has had an effect, but I’m not aware of other large changes – just of the continuous gentle pushing out of the envelope by inventive individual poets. What will it be like in 2033? Will the 40th Anniversary Tour be virtual? or beamed from space? will we still be around to find out?